Welcome to This is Gateshead - an exciting new website for visitors and residents. 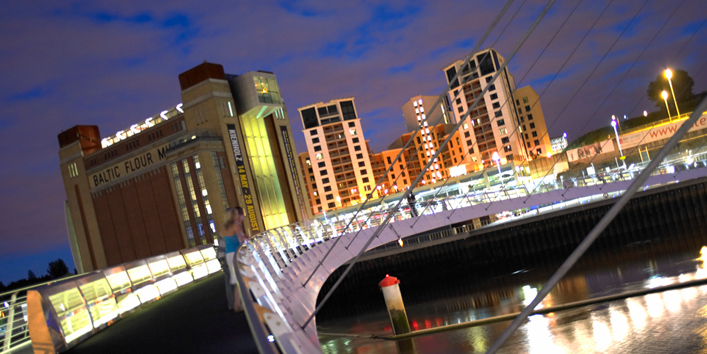 Experience the spectacular BALTIC Centre of Contemporary Art, the Gateshead Millenium Bridge, The Sage Gateshead and Gateshead Visitor Centre. Gateshead Quays lies in the heart of Tyneside next to the world famous Tyne Bridge. More than 200 million pounds has been invested in this new cultural quarter with riverside walks, fantastic architectural buildings, public displays of art and luxury residential apartments - Gateshead Quays is an ideal place for a day out and about. If you're looking for accommodation in Gateshead we have all the top places to stay and whilst you're here you'll want to eat at a Gateshead Restaurant, see Places to Visit in Gateshead or Entertainment in Gatehead. Gateshead is also home to the Metro Centre - Europes largest Shopping Mall! All the latest News from Gateshead – updated everyday. The Evening Chronicle is the daily, evening newspaper produced in Newcastle upon Tyne, covering Tyne and Wear, southern Northumberland and Northern County Durham. It was founded in 1885 by Joseph Cowen. Gateshead and regional sports news. The Namco Funscape in Metrocentre Qube will entertain young and old! Open 7 days a week from 10am to midnight. It features 18 ten-pin bowling lanes, the fastest dodgem track in Europe, a children’s soft play area, activity machines, electronic games and a fully licensed bar screening Sky Sports. Site of the former Watergate Colliery and ‘Gateway’ site for the Great North Forest. Lake, woodlands and wildflower meadows; National Willow Collection Sculptures Marked routes including easy access for all route. Public events are often held at this site.